A few weeks back Lydia Cole and colleagues published a really cool paper exploring recovery rates of tropical forests. Seeing as it’s something I’ve covered a here before in relation to my work on secondary forests recovering after agricultural clearance and recovery from selective logging, I invited Lydia to write a guest post giving a different perspective to a topic I have discussed here before. Thanks to Lydia for stepping up to the plate and I hope you find her post as interesting as I did. Anyone reading this blog probably doesn’t need reminding of how important tropical forests are! Birds, bees, berries and a whole load of other plants, animals and services that we probably underestimate our reliance on. Despite the many arguments in favour of keeping tropical forests standing, vast areas continue to be deforested at rapid rates resulting in changes like that shown below (Fig 1), under pressures of expanding human population, rising consumption and the agricultural footprint to match (Geist & Lambin, 2002). 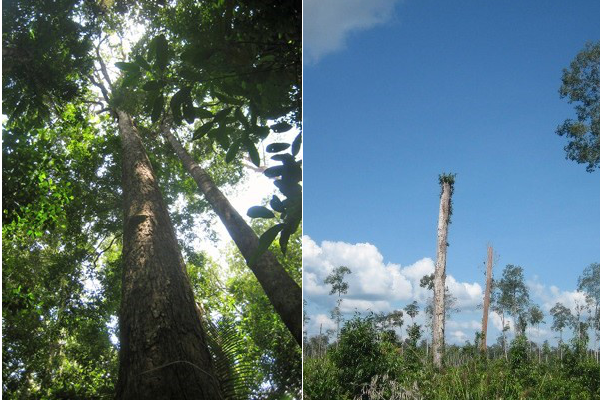 Fig 1 – Forest disturbance like logging can lead to forests such as this one in Borneo being converted from intact (left) to heavily degraded (right). 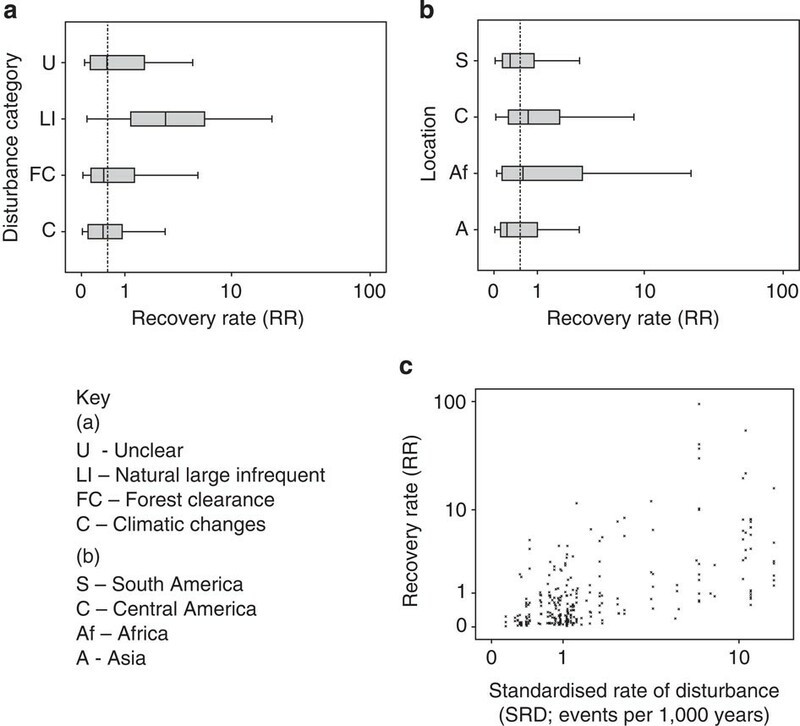 Disturbance and recovery in tropical forests Despite this widespread clearance as a result of recent international forest conservation initiatives and rising rural-to-urban migration (Mather, 1992), some degraded tropical forests are being given a chance to recover. But how long does it take them to recover? Much recent research has attempted to answer this question (e.g. the great work of Chazdon et al., 2007) but little has monitored change over time scales of >50 years. Since many tropical trees have lifespans much longer than this previous studies have only captured a snap-shot of the ecological process of recovery. In our study, we attempted to answer the question again; this time by looking into the past to gather data over longer time scales that could offer a more complete picture of forest recovery post disturbance. Palaeoecology, otherwise known as long-term ecology, uses fossils to decipher how plants and animals interacted with their environment in the past. Fossil pollen grains come in all shapes and sizes, and their morphological characteristics can be used to identify the plant family, genus or even the species to which they belong. When a collection of these grains are identified and counted from a layer of sediment, we can reconstruct what the vegetation was like at that point in time when those grains were deposited. In our project, we were interested in studies that documented disturbance-induced changes in fossil pollen from forested communities across the Tropics, over the last 20,000 years. Types of disturbances ranged from climatic drying events and landslides, to shifting cultivation and human-induced biomass burning. We found 71 studies published on tropical forest palaeoecology that satisfied our selection criteria (e.g. within 23oN/S of the equator, possessing a sufficient chronology), documenting 283 disturbance and associated recovery events. The rate at which recovery was occurring across the different forests and disturbance events was the key variable of interest and was calculated as the percentage increase in forest pollen abundance per year relative to the pre-disturbance level. How far and how fast have tropical forests recovered in the past? Our results demonstrate that in the past the majority of forests regrew to less than 100% of pre-disturbance levels, prior to declining again or reaching a new baseline; the median recovery was to 95.5%. They also recovered at a variety of speeds, ranging from rates that would lead to 95.5% regrowth in less than 10 years to those taking nearly 7,000 years; the average was 503 years. This is significantly longer than the periods adopted by logging companies between extraction cycles! What affects the rate of recovery? Three of the different factors we investigated for their potential effect on the forest recovery rate seemed to be of particular importance: geographical location, disturbance type and frequency of disturbance events. Of the four key tropical regions, Central American forests recovered the fastest and those in Asia the slowest (Figs. 2 & 3). This is concerning, given that forests in Southeast Asia are currently experiencing some of the greatest rates of deforestation of all tropical regions, primarily due to the economic profitability of oil palm agriculture (check out mongabay for details). Fig. 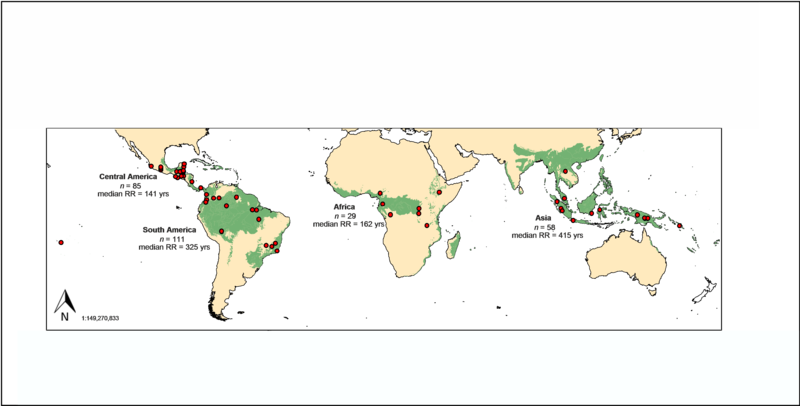 2 Map of tropical forest distribution, the location of studies and relative recovery rates across regions. The most common form of disturbance, and one from which forest regrowth happened relatively slowly, was anthropogenic impact, i.e. via logging, burning and/or for agriculture (Fig. 3). The slowest rates of recovery occurred after climatic disturbances and the fastest after large infrequent events, e.g. landslides, hurricanes and natural fire. This latter result is somewhat intuitive given that these perturbations are a natural part of all ecosystems, leading to the evolution of a dynamic response in the native plant communities. Fig. 3 Composite figure showing how the recovery rate varies with different variables. When we looked at the standardised rate of disturbance events (SRD), i.e. the number of disturbance events per 1,000 years, we found that the greater the frequency events occurred in the past, the more quickly the forest responded to each subsequent disturbance. This runs counter to contemporary theories on resilience that describe slowing rates and diminishing ability to recover with each subsequent perturbation (e.g. Veraart et al., 2012). Our results suggest that over ecologically meaningful timescales, i.e. over the life-span of entire forest communities rather than single trees, increased exposure results in adaptation to that disturbance over time, leading to a greater ability to recover quickly from the perturbation. What does this all mean for tropical forests? From looking back into the past, it seems that tropical forests can take a long time to recover from disturbances, and that different regions may require different management regimes to encourage more complete reforestation after natural or anthropogenic events, such as fire. Central American and African forests may bounce back from impacts more quickly than the other regions, with disturbances such as tropical hurricanes and climatic fluctuations being a more common component of these ecosystems than in the other tropical regions. However, all of the forests we looked at demonstrated a greater vulnerability to anthropogenic impacts and climatic changes than large infrequent disturbances: the two major forms of disturbance occurring today and at levels that far exceed those experienced over the past 20,000 years – reasons for caution. Identifying and understanding the different ecological requirements of forests across the different geographical regions, and of the forest-types within those regions, is vital for developing more sustainable landscape management plans. With increasing international concern over deforestation rates, the associated loss of biodiversity and elevated carbon dioxide emissions, the conservation and restoration of tropical forests is becoming more politically and economically feasible. Indonesia, for example, has introduced ‘ecosystem restoration concessions’ in the last decade, providing a legal means for forest protection from the further expansion of industrial agriculture. And the potential of Reducing Emissions from Deforestation and Forest Degradation (now REDD+) to save the World’s forests continues to generate international debate. Of importance to all of these programmes and initiatives, is the suggestion from our study that forests take time to recover, and if we give them that time, they will persist, and continue to provide their faunal inhabitants, including us, the greatest collection of biological riches on Earth. Looks like a problem with this post, it says it’s password protected. Hey Jeff, sorry was just doing a bit of editing. it’s up now and should work fine. Thanks, can see it now. Reblogged this on A jungle scientist.